I made some edits to this post after some feedback from Dru Knox, a Chrome PM. I’ve marked them with “Edit:”, so please be sure to note those changes! 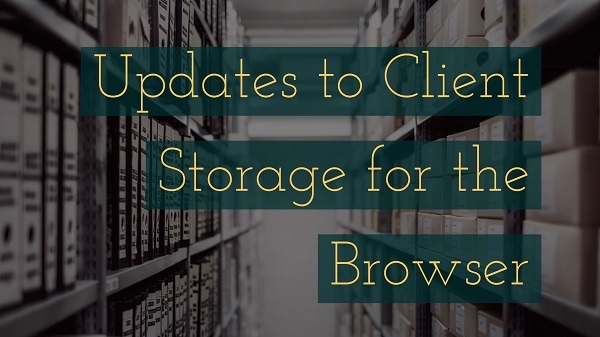 Luckily, as offline and PWAs have become increasingly more important over the past year or so, browser vendors (some more than others) have stepped up to the plate to help remove some of this ambiguity and make the storage system a bit more solid. Earlier this week I read a good article on these efforts by Chris Wilson, Persistent Storage. I suggest reading that article before continuing on. The basic premise is that there is a new API for what is called a StorageManager. The StorageManager, at least for now, consists of three basic parts. The first, and this is the main focus of Wilson’s article, is the ability to specify that data should be really persisted. This is the persists API. Yes, that name is a bit weird. Basically the idea is this. I can tell the browser to store the value “Cat” in LocalStorage under the key “BestAnimal.” Currently the browser will store this, but also kick it to the curb when the browser sees fit. Data that is persisted though will be permanent. This is cool, but I really take issue with the naming. I get that there is a difference between “lasts a random amount of time” versus “lasts forever”, but even in this it’s more “The browser won’t nuke it, but the user can”, which isn’t truly persistent either. But… yeah, naming is hard, and frankly, I can’t think of a better way to describe this either. The persist property of the StorageManager interface returns a Promise that resolves to true if the user agent is able to persist your site's storage. Oh and that new Cache thing that is for ServiceWorkers that I’ve not looked at yet. So what’s covered? Everything but cookies and WebSQL. I think that’s fair as you shouldn’t be using WebSQL anymore (outside of SQLite in Cordova though) and cookies are - well, cookies. In general this makes sense, but I don’t understand why a user can’t have more bookmarks (I’ve got a crap ton) and I also don’t like the requirement that push notifications are enabled. I get enough notifications from apps. I wish apps would stop thinking they are so important that they deserve the right to bother me at any point in time. Ok, a bit of a rant there. I love the idea of notifications, especially with support in the web browser, but I wish it was a feature people would use less of. It’s one of those “With great power…” type things that people just seem to want to abuse. Edit: To be clear, the list above is a list of options and you only need to satisfy ONE of them! That being said, I did some testing (and I’ll be sharing some code below), and it looks like you can’t test this feature locally. To be clear, it doesn’t really break anything per se, even when the API tells you no, you can still store data in your various buckets, but if I want to really test this out I’d have to test on mobile. And I guess delete my bookmarks to if I have too many. Notice that the third requirement essentially means this is a non-starter for desktop. Maybe the thinking is that it won't be necessary since desktops typically have lots of free space? But I can tell you right now that my iPhone has more free space than my MacBook Pro. And finally - here’s a cool part. You can ask the browser to persist even after you’ve already stored data. So if you’ve been using IDB for a while (first off - congrats! ), you can ask for this permission now and it applies to the data you’ve already stored. Again, assuming you can pass the requirement test. The second part to StorageManager is simply a check to see if your data is Really Persistent. (That’s it, that’s the name I’m going with!) This API is persisted(). Yep, I’m not going to screw up that ever. Honest. And the third part, not covered in this article but discussed over at MozDevNet, is the estimate() method. This is a cool one. It returns a quota and usage value. Now the quota isn’t a hard and fast limit, it’s an estimate, but it’s still something! Support for these features is a bit wonky right now. Chrome supports persist() and persisted() but not estimate(), even though MozDevNet says it should be supported. Firefox only supports the estimate() method but you must enable it via a config setting. So this is all a bit rough… but the important thing to note is that it is a beginning! I think it will go a long way to making storage, in general, much more robust on the web platform. Ok, with all that out of the way, I did build up a simple demo. I modified the code Wilson had used in his article and made it a bit more complete. I was also curious if Chrome Devtools flagged anything different when this feature was enabled, but as I couldn’t test it, I don’t know if it does or not. The absence of anything visible now doesn’t mean it isn’t supported - perhaps they only flag the data when this feature is enabled. Anyway, here is a full example.